Los Angeles County Sheriff's Deputies have arrested the man state authorities call the "mastermind" of rental scams. Richard Rodriguez was taken into custody without incident at his Alhambra home early Thursday on felony conspiracy to defraud charges. "We believe we have possibly over a thousand victims," said Lieutenant Phillip Marquez of the Los Angeles County Sheriff's Department. Investigators believe that Rodriguez improperly took over $200,000 last year from customers at Superior Consulting Services in Rowland Heights, a rental listing agency, Marquez said. Los Angeles County Sheriff's detectives are now actively investigating the man authorities say has scammed thousands of renters in southern California through numerous apartment finder services. Joel Grover reports for the NBC4 News at 11 p.m. on Thursday, Nov. 17, 2016. 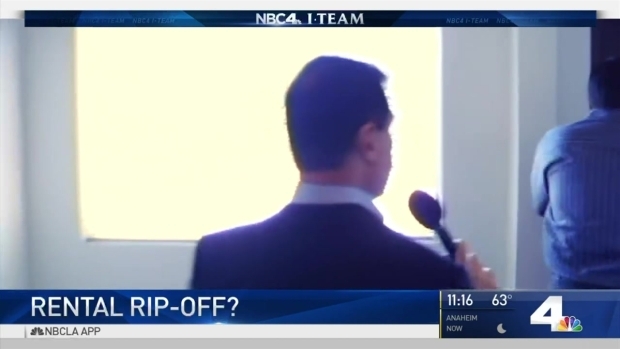 For years, the NBC4 I-Team has been investigating Rodriguez's rental agencies. Authorities said he preyed on people desperate to find affordable apartments and homes to rent, by offering them bogus rental listings in exchange for cash. "He had no intentions to find anybody any type of rental properties," said Marquez. The I-Team has identified at least six rental agency locations over a nearly two decade period where Rodriguez and his associates conducted business. Local and state officials said Rodriguez may have victimized thousands of people during that time. Many of them have been calling for his arrest for years. "I hope he does go to jail," said Juan Arteaga. Arteaga said he was a recent client of Rodriguez. The San Bernardino man was so desperate to find an affordable rental house for his wife and five children that when he saw something he could afford on Craigslist, he immediately jumped at the chance to grab it. "We contacted them and then he told us, come in, bring 200 dollars," explained Arteaga. The NBC4 I-Team again catches an alleged rental fraud “mastermind” who might have cheated thousands of would-be renters. Joel Grover reports for the NBC4 News at 11 p.m. on Monday, Nov. 14, 2016. Arteaga said he was instructed to come to Sunset Home Rentals in Ontario which he said is run by Rodriguez. He said he gave a Sunset employee $200 in cash, some work paystubs and his Social Security card. What he got was a list of addresses that the employee said were inexpensive rental listings. "One of them was an empty lot and the other one was a boarded up home," said Arteaga. Arteaga returned to Sunset Home Rentals to try and get his money and personal information back. "The store was closed, lights were off, door was locked, and phones were disconnected," said Arteaga. "It is a scam," he said. That's the pattern that the NBC4 I-Team has exposed over the years. The California Bureau of Real Estate said Rodriquez lures customers to his rental listing offices by placing ads on craigslist for cheap apartments and homes. When a customer calls the phone number on the ad, they are told to come to an office, pay around $200 and that they will get a list of available rentals. But the NBC4 I-Team spoke to dozens of people who said those listings didn't exist. "They gave me fake listings," said Reyna Gonzales, a customer of Superior Consulting Services in Rowland Heights last fall, another business that authorities suspect was run by Rodriguez. "They gave us the runaround, put us on hold, 30 minutes later, let me call you back in an hour. Call again, call again. Runaround. Runaround." And the I-Team discovered evidence that Rodriguez has been doing this since 1996, when the state ordered his first agency to stop doing business. But the I-Team caught Rodriguez opening other rental listing businesses under the names Global Rentals, International Home Rentals and Hacienda Home Rentals, among others. Each of these businesses was operated in a similar way, according to Dolores Ramos at the California Bureau of Real Estate. But the NBC4 I-Team stayed on his trail. In November, the I-Team found Rodriguez at Superior Consulting Services in Rowland Heights. Customers told the I-Team that Rodriguez was the man in charge. When we attempted to speak with Rodriguez, he literally shoved us out the door, telling us to "get out of here." Days later, Los Angeles County Sheriff Deputies served a search warrant on the business, arresting several Superior employees and seizing files. They didn't get Rodriquez because he was nowhere to be found during the bust. "I want Richard Rodriguez to serve time," said former customer Reyna Gonzales. That could happen to Rodriguez if he is convicted. He was taken to the Los Angeles County Sheriff's Walnut-Diamond Bar station and booked on felony charges of Conspiracy to Defraud. He could face up to three years in state prison. "We're hoping what this arrest will show is that if you are out there defrauding the public, that we will investigate and if that investigation shows that you were breaking the law, you will be arrested," warned Marquez. The Los Angeles County District Attorney's office is now examining the case. And Lieutenant Marquez told NBC4 seven of Rodriguez' employees will also be charged with a felony. The Los Angeles County District Attorney's Office Consumer Protection Unit is prosecuting the case against Rodriguez. He is scheduled to appear in court on Monday, May 1, 2017 in Division 30 of the Los Angeles Superior Courthouse in Downtown Los Angeles.